Sean Lawton follows throught after teeing off while playing FlingGolf at Wenham Country Club. At 6 feet 2 inches and 225 pounds, James Fahey looks every bit the professional lacrosse player he is. On the golf course, the Boston Cannons defenseman cuts an imposing figure. But it’s his “club” of choice that turns heads. Fahey uses a FlingStick to play his newfound sport, FlingGolf, an entertaining hybrid of golf and lacrosse. 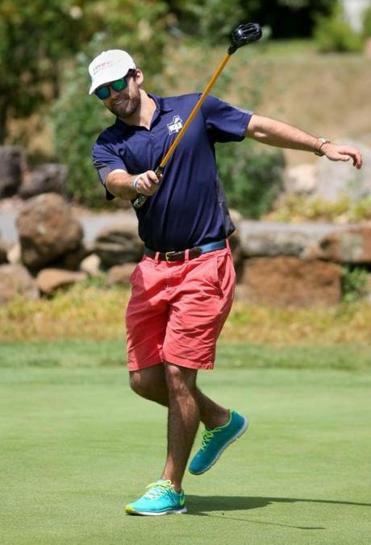 Fahey, 22, never golfed while growing up in Boxford, or while attending St. John’s Prep and the University of Massachusetts Amherst, from which he graduated last year. 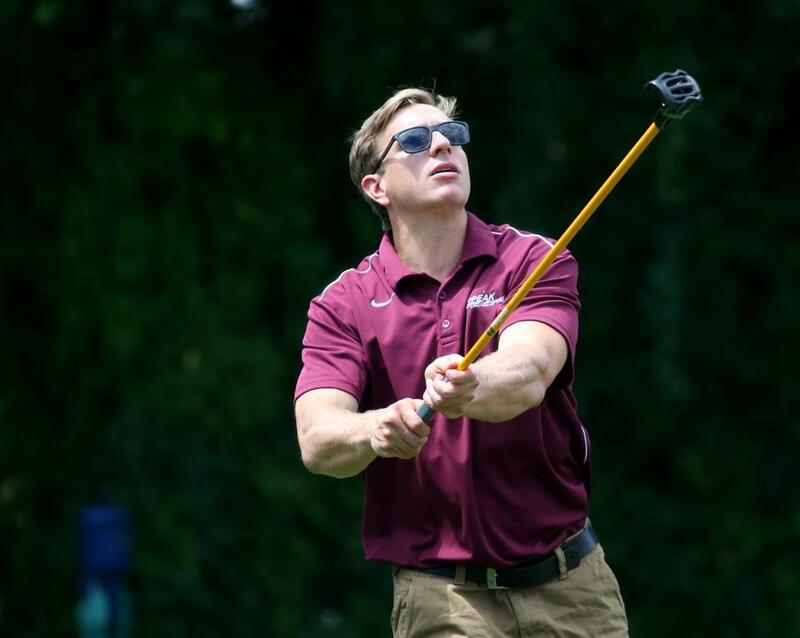 But when Alexander Van Alen of Ipswich and Steve Bloom of West Newbury decided to take their new invention of FlingGolf and partner with Major League Lacrosse, Fahey was intrigued. FlingGolf is now offered at courses throughout Eastern Massachusetts, including, to Boston’s north, Murphy’s Garrison Golf Center in Haverhill, Ould Newbury Golf Club, Middleton Golf Course, Cape Ann Golf Course in Essex, and Unicorn Golf Course in Stoneham; to Boston’s south, Cedar Hill Golf Course in Stoughton, Ledgemont Country Club in Seekonk, Foxborough Country Club, and Norwood Country Club; and to Boston’s west, Cyprian Keyes Golf Club in Boylston, Maynard Golf Course, Needham Golf Club, and Juniper Hill Golf Course in Northborough. “The great aspect of FlingGolf is that it integrates so seamlessly with traditional golf,” said Richard Luff, owner of Sagamore Golf in North Hampton, N.H. “On Thursday, we hosted a business group made up of golfers and nongolfers. The FlingStick allowed the nongolfers to get out on the course and play right alongside traditional golfers, and still be able to enjoy the beauty of being on a golf course. “It seemed like a much simpler way,’’ he said, “to get people out onto a golf course without the complexities and conventions associated with traditional golf, like 14 clubs, a 140-page rule book,” and a steep learning curve, he said. Newton’s Kevin Osgood of Sterling Golf Management, which owns or operates 10 public golf courses in Greater Boston, agreed. “Since golf has slowed down since around 2004, we have been looking for new ways and new ideas to keep business growing, and FlingGolf was one of them,” said Osgood. Van Alen, who grew up playing lacrosse in Philadelphia, invented FlingGolf after tossing around a golf ball with a jai alai basket on local Ipswich fields. Van Alen worked with product development firms Fikst in Woburn and Tool Inc. in Marblehead for more than a year to finalize the FlingStick design, then hired Somerset Plastics in Connecticut to make the specialized head that could cradle a golf ball. Essentially, FlingGolfers use a FlingStick to throw the ball toward the hole, instead of hitting it as you would with a golf club or hockey stick. In early 2013, Van Alen and Bloom established PlusOne Sports, the parent company of FlingGolf. Among the original board members was Walter Lankau, who at the time owned Stow Acres Country Club and was president of the National Golf Course Owners Association. FlingGolf is appealing on several levels. It’s easy to get started, with most players, including young children, able to pick up the swing within 15-30 minutes. Since only a single FlingStick is required, the initial investment is low (FlingSticks run $99 to $149). And you can play in the same foursome as golfers, accommodating dissimilar groups. James Fahey reacts to a putt in Wenham. Following a demonstration in early 2014, Luff thought the game had potential, but his staff was less enthusiastic, he said. Van Alen said the company has experienced similar reactions as it unveiled FlingGolf. That led to FlingGolf’s relationship with the Boston Cannons and Major League Lacrosse. To learn more about FlingGolf, including the rules, or to find a local course that offers the sport, visit FlingGolf.com .If you have an idea for the Globe’s “On the Move” column, contact correspondent Brion O’Connor at brionoc@verizon.net.